The photo essay on these pages illustrates the process of building a viola, step by step. Each of the nine stages referenced below has its own captioned slideshow. Setting the Neck: I've marked on the side of the neck in pencil the approximate placement of the edge of the top, in order to gauge progress. I've just finished cutting a rough hole in the body, which I determined by placing the neck where it belongs, tracing the sides with a pencil onto the ribs, and sawing down into the ribs and upper block on each side of the neck. Then I chiseled out the wood between the cuts. Now I can start cutting the hole wider and wider. Aligning the Neck: As I widen the hole, the neck moves farther towards its final position. I adjust my cuts to ensure that it's straight to the body, angled correctly for bridge height, just the right length, and not tilted sideways. It has to fit perfectly with no play so that it goes into its mortise exactly the same way every time, and the bottom of the board has to be the proper distance from the top. Finally, it has to fit well enough to make a perfect glue joint. 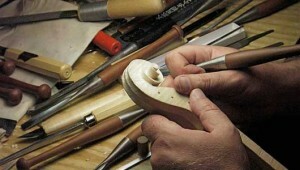 Gluing in the Neck: Clearly, the neck set is one of the most challenging points in the making of a violin. Nevertheless, if everything's been done correctly, all it takes to glue the neck in with confidence is one clamp. Marking the Button: Amost all the major woodworking is done now. All that remains is the final carving of the neck, and the last bit of finish detailing. Two sideways saw cuts, one on each side of the heel, locate the edge of the button. Based on those, I use a template to mark the circle that will form the button. Finishing the Button and Heel: Once the button is marked, the entire heel is carved, and this viola is nearly ready to varnish. Visitors are welcome at the shop by appointment during regular business hours, 10:00 a.m. to 5:00 p.m., Monday through Friday. Every June, I teach violin making and setup at the Southern California Violin Making Workshop in Claremont, organized by Jim Brown of J Brown Violin Maker. All skill levels are welcome and participants can sign up for one or both of the week-long sessions. In addition, master bow makers Lynn Hannings and George Rubino alternate summers teaching bow making. Jim does a wonderful job of organizing, hosting, and fostering a congenial atmosphere. Participants come from all over the US and several other countries. The SCVMW is a fantastic experience and always a high point of my year.